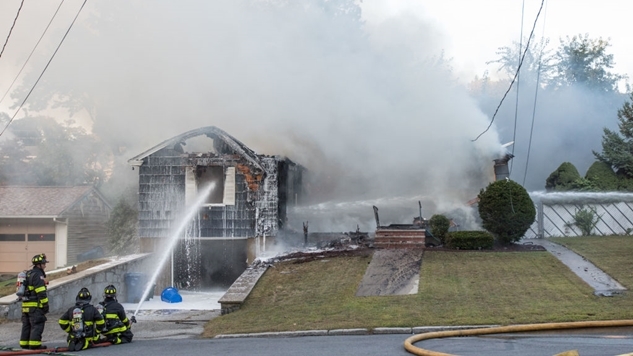 More than 60 fires and at least three gas explosions rocked Lawrence, North Andover, and Andover in a staccato burst of flame and fear late Thursday afternoon, damaging scores of buildings and prompting mass evacuations from homes served by Columbia Gas. The images from the scene were beyond harrowing. Imagine your home instantly becoming engulfed in fire seemingly out of nowhere, and that’s what countless Massachusetts residents experienced yesterday. A spokeswoman for the Massachusetts fire marshal's office said that investigators were looking at overpressurization on a gas main owned by Columbia Gas, a company that was upgrading equipment in the area. Because we live in the dumbest time in human history, this explanation of a likely screw-up wasn't enough for the army of internet sleuths who have far more time on their hands than sense, and a familiar trope emerged: Russia did it. The first to widely spread this nonsense was famed anonymous hacker “The Jester,” who pushed this garbage out to his more than 188,000 followers. ^^^ If I was a foreign adversary with cyber capability, I'd have evaluated by now that launching an offensive operation while Trump is in office, and the government is in absolute disarray would be the perfect time. He then found whatever shred of journalistic integrity was left in his body, and clarified that he wasn't making any allegations, despite the very obvious narrative in the tweets he just laid out. ^^^ CLARIFICATION: I'm not saying this is a SCADA/Cyber attack, I'm saying this is how it would look if it was a dry run to observe our response gone awry. We also know, coincidentally, that Energy Secretary Rick Perry arrived in Russia on September 11, and that Russia state media has announced he's meeting with sanctioned Russian state nuclear energy corporation Rosatom while he's there. So what she's insinuating is that Energy Secretary Rick Perry is involved in a conspiracy to effectively bomb a Massachusetts town in order to help Russian energy companies. I would make a joke about how phenomenally stupid that is if I weren't shaking with rage right now. What all these “I'm just asking questions” types fail to include in their analyses is what Russia would get out of trying to blow up a small town in northern Massachusetts. Well, I was trained at UMass to think from perspectives other than my own while pursuing my political science degree, so let me help these buffoons here: Russia would get almost nothing out of an attack like this. In fact, it would be completely counter-productive to Russia's stated goals. Vladimir Putin has been very clear that he wants to control as much of Eastern Europe as possible while winning the race for the oil reserves opening up in the Arctic thanks to climate change. He wants us to continue our partisan squabbles, and will do as much as he can to inflame existing tensions in America. An attack like this would unite us, and completely contradict his main goal of dividing us. Not to mention, getting dragged into a war with the United States and NATO would undoubtedly take most of Russia's resources away from Putin's two main goals of extending Russian influence into Eastern Europe and the Arctic. Bombing the United States only makes sense if you have a child's conception of how the world works, and you think that Russia is THE bad guy, therefore the only motivation they need is to do bad things. But for us adults who know to think about countries acting in their own self-interest when it comes to international relations, that argument is so incredibly stupid that there are no words to fully encapsulate its fraudulence. The Russia red herring is no different than the QAnon fever dream on the right where everything unexplainable can be explained away by the fairy tale of bad guys operating in the shadows. Make no mistake about it: Russia does want to harm the United States. However, doing it in such a dramatic fashion would counter all their other operations that are doing a good job of dividing us right now (besides, a “dry run” like this isn't very dry when it causes a 10-alarm fire that spans across three towns). Yes, they have hacked in to our energy grid, but so have the Chinese, Iranians and maybe some of our allies as well. This is the new Cold War. Instead of every global power pointing just nuclear weapons at each other in a bid of mutually assured destruction (which is still happening), it now also includes cyber weapons. Russia owns our electric grid because we own theirs. Same with Iran. Every time we get a scary story about how one of our adversaries has made digital inroads into our infrastructure, understand that whatever they're doing to us, we've done to them and then some. This is the new world we inhabit. Russia is an adversary, but if they were to launch a massive attack on the United States, it would hurt them more than help them. They would lose hundreds of millions of dollars per year in direct trade with the United States. America's largest trading partner, the European Union, is Russia's largest trading partner too, and the EU would no-doubt impose sanctions to drastically undercut that relationship. You think Russia is isolated on the world stage now? A 9/11-style attack on the U.S. would destroy their already fragile economy—which is still better than the disaster of the 1990s, and the stability it provides is the main source of Vladimir Putin's popularity. If Russia's economy crashes far enough, Putin's presidency will become threatened. It's that simple. The only people who think that Russia would stage an attack similar to the tragedy in Andover, North Andover and Lawrence are people who have absolutely no knowledge of how the world actually works. Sure, it's possible that Russia did this. It's also possible that The Jester and McEwan are Russian assets planted here to disseminate disinformation like this in order to spread even more chaos among the populace. I'm not making that accusation, but I will say that scenario is far likelier than Russia dramatically escalating a soft war that they're clearly winning. A law called Hanlon's Razor that I religiously adhere to in analyzing the news likely applies to both the explosions in this area north of Boston, and to understanding the motivations of the people who pushed this garbage conspiracy theory in its wake: never attribute to malice that which can be adequately explained by stupidity.